Despite the cold outside…. you can feel the inner warmth of these wonderful people. We spent the day in Sheikh Jarrah, East Jerusalem today. 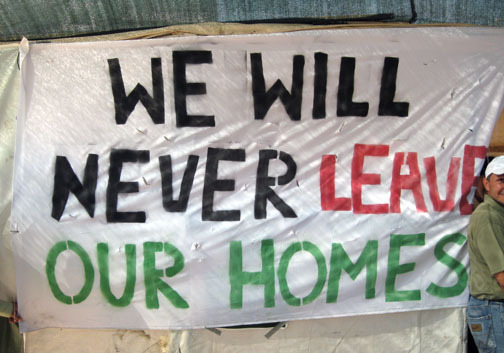 28 Palestinian refugee families are at the threat of being evicted from their homes to become refugees again. Four families have already been evicted and thrown out on the streets of Sheikh Jarrah by Settlers with the support of the Israeli government – Police and Military involved. The story of these internally displaced refugees is heartbreaking. Listen to Nasir as he shares with us the background of what is happening in Sheikh Jarrah. Note: Nasir only started learning English 17 months ago, and is a fluent Hebrew speaker as well. A man with many talents he is a graphics designer by profession, but has now made staying outside his own house in a tent his full-time duty. He shares his story with all the visitors, and even attempts to converse with his Occupiers. This was the largest demonstration yet in Sheikh Jarakh, were for some time now a demo is taking place every Friday, much like the demos in Bil’in, Nilin and other places. The Friday before, the police had brutally squashed the protest and arrested 11 demonstrators, among them the director of the Association for Human Rights. Contrary to their usual treatment of peace demonstrations, the media this time covered the event extensively. The behavior of the police upset many who generally do not take part in demonstrations. This time they felt they must take part. So almost a thousand protesters gathered today (Friday, 22.1.10) in an empty plot opposite Sheikh Jarakh, a few dozen yards away from the houses from which Palestinian families had been thrown out in order to allow settlers to move in. Side by side with the old battle horses one could see people for whom this was the first time. Among those who came was former minister Yossi Sarid. Also present were the painter Uri Lifshitz and several professors from the Hebrew University, whose buildings could be seen on a nearby hill. More or less young people stood besides more or less old ones, with the young shouting slogans, whistling with whistles specially donated for this purpose, singing and drumming. Almost all were Jewish. One protester brought flowers and tried to deliver them to the police commander, who froze and did not move a muscle in his face. She put the flowers at his feet, where they remained, until, in the end, one of the protesters claimed them as booty. The police dictated the place and the time: across the road, until 4 p.m. “One minute after 4, I shall disperse the demonstration by force,” the commander announced. On the hill opposite, a large detachment of border police was waiting. But the protesters were not in the mood for dictates. After demonstrating for some time at the appointed place, shouting slogans, singing and whistling, at ten minutes after 4 they moved forward, crossed the road and marched towards the disputed houses. They were, however, stopped by a chain of border police. At this stage, a number of protesters were already arrested, while their comrades shouted and whistled. For two more hours, until darkness descended, there were several such incidents – the police arrested protesters, the demonstrators shouted slogans (“A brave policeman beats demonstrators”). One protester was thrown to the ground and then she was arrested and dragged to the police car like all the rest. All though the demo, ultra-Orthodox Jews in their Shabbat attire with their children pushed their way through the crowd on their way to the nearby grave of the Righteous Rabbi Shimon. Nobody hurt them. From time to time they were greeted with loud shouts of “Thieves, go home!” because the grave is located in occupied territory. The story that was published, that demonstrators had attacked them, was a blatant lie. 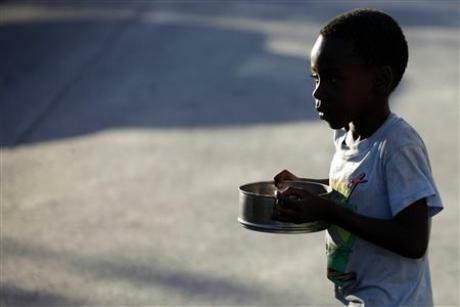 PORT-AU-PRINCE – Haitian police have arrested 10 U.S. citizens caught trying to take 33 children out of the earthquake-stricken country in a suspected illicit adoption scheme, authorities said on Saturday. at checkpoints and roadblocks, suffering like us when young white police officers prevented us from moving about. 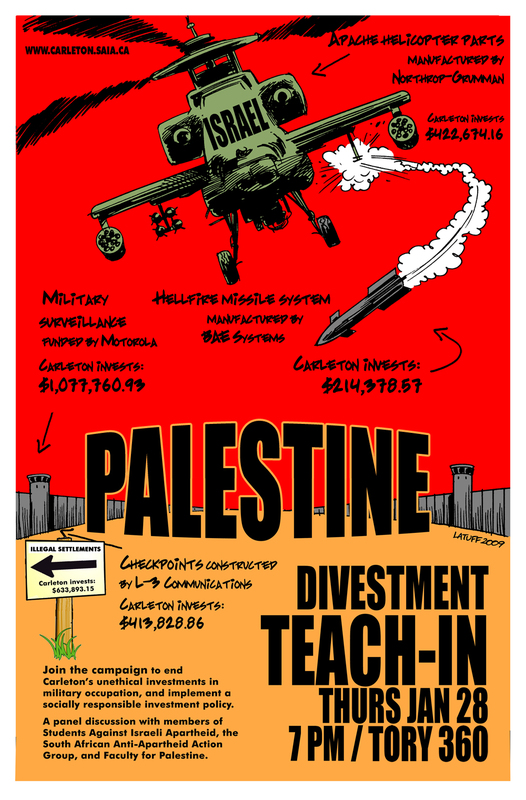 SAIA demands that Carleton University immediately divest its stock in BAE Systems, L-3 Communications, Motorola, Northrop Grumman, and Tesco, and adopt a Socially Responsible Investment policy. “All of the soldiers and officers whom we sent to battle need to know that the state of Israel stands behind them even on the day after,” Barak said. Israel has submitted to the United Nations details of the investigations it conducted into war crimes allegations raised in a reports into the 22-day Gaza war, which ended last January. Ehud Barak, the Israeli defence minister, told reporters in the southern Negev desert on Friday that his report backed the army’s actions during Operation Cast Lead. The 575-page report, compiled by Richard Goldstone, a South African judge, concluded that there was “strong evidence” Israel had committed war crimes during its bombing and shelling of Gaza. The Palestinian Hamas-run government in Gaza was also accused of war crimes during the conflict that left about 1,400 Palestinians and 13 Israelis dead. Hamas said it had prepared a 52-page response to the Goldstone report, which had accused the Palestinian fighters of targeting Israeli civilians by firing hundreds of rockets across the de-facto border. Salah al-Bardaweel, a senior Hamas official, hinted at the content of the report on Thursday. “The killing of three Israeli civilians as alleged by Israel and as mentioned in the Goldstone report was by mistake and the target was military installations inside the Zionist cities”, al-Bardaweel said. The UN General Assembly in a November 5 resolution endorsed the Goldstone report and gave Israel and the Palestinians three months to undertake “independent, credible investigations” into the allegations against them. That deadline expires on Friday, February 5. But Ban Ki-moon, the UN secretary general, had asked both sides to report to him on the progress made so far so as to enable him to report back to the General Assembly before the February deadline. With next week’s deadline nearing, Israel is still in the midst of a heated debate as to whether it should heed the General Assembly resolution calling for an independent inquiry. So far it has had its own military investigate the incidents raised in the Goldstone report, but has not established a probe independent of the army. Barak and army chief of staff have so far opposed a commission that would expose private soldiers to legal prosecution, because they fear that would compromise combat in the future. According to the officials quoted in the Yediot Ahronoth newspaper, only higher-ranking officers with the rank of brigadier-general and up, as well as political leaders including former premier Ehud Olmert, would have to appear before the commission being considered by Benjamin Netanyahu, the Israeli PM. One government official told Yediot that Israel had “no choice” but to form such a commission if it wanted to escape prosecution at the International Criminal Court in The Hague. IS YOUTUBE FINALLY PREPARED TO SHOW THE TRUTH? An increase in the activities in Occupied East Jerusalem has apparently sparked enough interest throughout the world for YouTube to agree not to pull the videos off the Web. 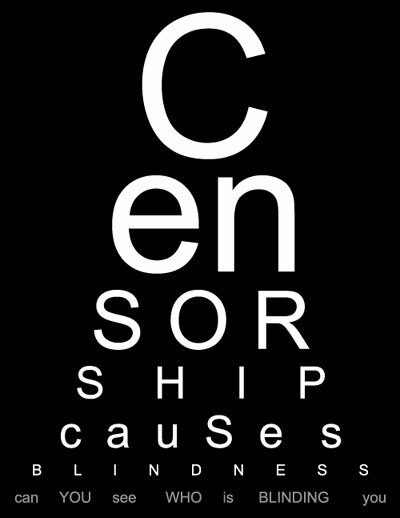 Could we be seeing an end to their zionist censorship? Let’s hope so…..
Social media sites like Facebook, YouTube and Twitter, along with a slew of blogs, are playing an increasing role in the growing participation of young Israelis in protest rallies in the east Jerusalem neighborhood of Sheikh Jarrah, activists and journalists familiar with the situation there told The Jerusalem Post on Monday. Activists and journalists both described a situation in which protesters were relying on the Internet to try and affect change on the ground and raise awareness of the arrests made during demonstrations in the neighborhood. “It’s all Facebook, e-mails and Twitter,” said Didi Remez, a human rights activist, who has become noticeably involved in the Sheikh Jarrah protests as of late. Remez was arrested during a protest there last Friday. Remez also said that distant audiences, like American Jews, who might be deprived of Sheikh Jarrah coverage due to the mainstream media’s lack of interest, were instead staying abreast of the situation via social networking sites. Others echoed Remez’s comments, but added that another advantage of social media was its ability to counter police statements about Sheikh Jarrah they said the mainstream media often parroted. “This is an issue that the media hasn’t really been covering, and when they have, they’ve mostly relied on police statements that portrayed the protesters as a handful of extreme leftists or anarchists, which is simply not true,” said Lisa Goldman, a Tel-Aviv based freelance journalist who has used Facebook, Twitter and blogs to follow the Sheikh Jarrah protests. Additionally, Goldman added, social media outlets had also served as a tool to awaken the mainstream Left to the goings-on in Sheikh Jarrah, including, but not limited to, the emerging issue of police behavior towards protesters there, which the Jerusalem Magistrate Court has even censured – ruling last week that the arrests of 17 protesters during a rally two weeks ago was illegal. Goldman also pointed to the participation in last Friday’s rally of Prof. Moshe Halbertal, who helped draft the IDF code of ethics and who has been active in disputing the United Nation’s Goldstone Report, as an example of figures who would certainly not be considered extreme, but who have joined the Sheikh Jarrah fray. Hagai El-Ad, the director of the Association for Human Rights in Israel and one of the 17 protesters arrested two weeks ago, added that the use of new media to circumvent the mainstream media, which, he said, was often “reluctant to cover hard issues, or blatantly hostile,” was spreading rapidly. Yet El-Ad did concede that the use of new media was a driving force behind the success of the Sheikh Jarrah protest organizers. Also see THIS related post about the ongoing demonstrations. The State denies the following, but in the case of other such scandals, ‘where there is smoke there is fire’….. let’s watch as this develops. was acquitted by a jury of all charges on August 6, 2009. A bill that would tighten regulations for patients seeking medical marijuana and the doctors approving it for them passed its first test at the state Capitol today.“This is the beginning of the end of the wild west” for Colorado’s medical-marijuana industry, bill sponsor Sen. Chris Romer, D-Denver, said. The 6-1 thumbs-up from the Senate Health and Human Services Committee came with the support of law enforcement groups eager for the state to crack down on what they say are abuses in the state’s medical-marijuana system. But it came over the objections of dozens of medical-marijuana advocates, who packed the committee’s meeting room and argued that the bill would hurt patients for whom marijuana is vital medicine. The bill requires that patients seeking medical marijuana have a “bona fide” relationship with the recommending doctor in which the doctor conducts a thorough medical exam and also provides follow-up care. The bill would also prohibit doctors from being paid by dispensaries to write recommendations and would mandate that doctors recommending medical marijuana not have any blemishes on their medical record. Ned Calonge, the state’s chief medical officer, said the bill would eliminate concerns that some doctors are rubber-stamping recommendations. “We need to make sure we meet the medical standard of care in running this program,” he said. The bill is supported by the Colorado Medical Society and law enforcement officials, who said regulation is needed to reign in abuses in the system. “We have to provide a line between the people in this room who legitimately need medical marijuana and the people who have exploited this program to use and to distribute marijuana,” said Jim Gerhardt, a sergeant with the North Metro Drug Task Force. But Corry called the bill a solution in search of a problem and said it violated provisions in the state constitution. Numerous patients told lawmakers they worried the bill would drive up costs or make it tougher to obtain their required doctor’s note. Denver resident William Chengelis said he receives medical care through the Veteran’s Administration but must consult another doctor to get his annual medical-marijuana recommendation because VA doctors aren’t allowed to give such recommendations. Having to consult with the recommending doctor multiple times would add hundreds of dollars to the cost of his care. The bill saw a number of amendments during today’s meeting. One amendment stripped out a provision that would have placed extra requirements on patients under 21 years old seeking medical marijuana. State Sen. Shawn Mitchell, a Broomfield Republican who was the lone no vote, said he needed a chance to study the amendments more closely before deciding whether he supports the bill as it is now written. “I wanted to make sure we’re not slamming doors that voters wanted to be open,” he said. Ellen Rosser, Professor of English and a veteran peace activist, maintained an office in downtown Gaza from September 2006 to June 2007. During that period she was an eyewitness to the events which eventually culminated in the violent clashes between Fatah and Hamas in the summer of 2007, ending with Hamas routing Fatah’s American- armed militias and ousting them from the Gaza Strip. Sister Ellen, as she is known, is neither pro-Hamas nor anti-Fatah so her “third party” testimony sheds light on the highly-contentious claims of guilt and innocence made by both groups, claims that continue to have a detrimental effect across Palestinian politics. When I spoke to her, she didn’t dwell much on the special relationship between Fatah’s former Gaza strongman Muhammed Dahlan and the Bush administration, mainly via US General Keith Dayton. (A thorough expose of Dahlan’s American connection was published in the American magazine Vanity Fair in April, 2008. However, she did point out that it was Dahlan’s men who tried to assassinate Prime Minister Ismael Haniya on 14th December, 2006, as he was returning to the Gaza Strip via the Rafah border crossing. Sister Ellen spoke of bullets flying and people fleeing for their lives. Moreover, her testimony does suggest that certain elements resumed the shooting every time a truce was reached between the two factions. She also shed light on the killing of a PA soldier which Fatah blamed on Hamas. “Some months later, the next events that I personally was aware of in the tragic series occurred when the Hamas Minister of the Interior, Said Siyam, wanted a video tape showing who had killed a Palestinian Authority soldier and wounded two others. It (the video tape) had been in the possession of Jad, who was killed, and then in the possession of Major Baha Balousha of Fatah, who refused to give it up. Rosser doesn’t say who threatened Balousha and killed his children. However, it was obvious that whoever did it had an interest in silencing him and preventing him from disclosing the contents of the video. Other sources spoke of Balousha possessing information on CIA money transfer to Fatah leaders in Gaza. “In other words, Prime Minister Haniyeh knew nothing about who killed the little boys and wished to express his sorrow at the tragedy. A few days later, however, he may have heard indications that Hamas members were involved, for on television he said that if ‘we [i.e. Hamas] have done anything wrong, we will pay diyya’ (blood money, a traditional Palestinian way of resolving such an issue). “However, that night when Haniyeh was entering Gaza after being held at the border for eight hours while Egypt decided what to do about the millions of dollars he was bringing with him, there was an assassination attempt on his life by some men who guarded the border, Mohammed Dahlan’s men. Rosser said she is sure that President Mahmoud Abbas was not aware of the attempted assassination of Haniyeh any more than Haniyeh was aware of who killed Major Balousha’s boys. Rosser goes on to describe the role played by Gen. Dayton in the mini-civil war in Gaza and how he was pushing constantly for escalation, both by bullying the PA to attack Hamas and also by supplying Muhammed Dahlan’s militia with truckloads of weapons. “At one point, while the bullets were volleying back and forth down the main streets in Gaza City and elsewhere, the US or more precisely, I’m sure, Gen. Keith Dayton, tried to intervene on behalf of Fatah, by sending in a truckload or more of weapons. Hamas learned of the shipment, however, seized it and used it. I asked Rosser if she thought Dayton consciously and deliberately pushed for the civil war in Gaza. Finally, I asked Rosser why she thought the western media continued to call Hamas’s defensive action “a coup”, thus ignoring the fact that the movement was democratically elected by a majority of Palestinians. She said that the western media have been very biased against Hamas as they once were against the PLO before 1991. They presented Hamas negatively and unjustly as a “terrorist” organization instead of as the elected government of Palestine. 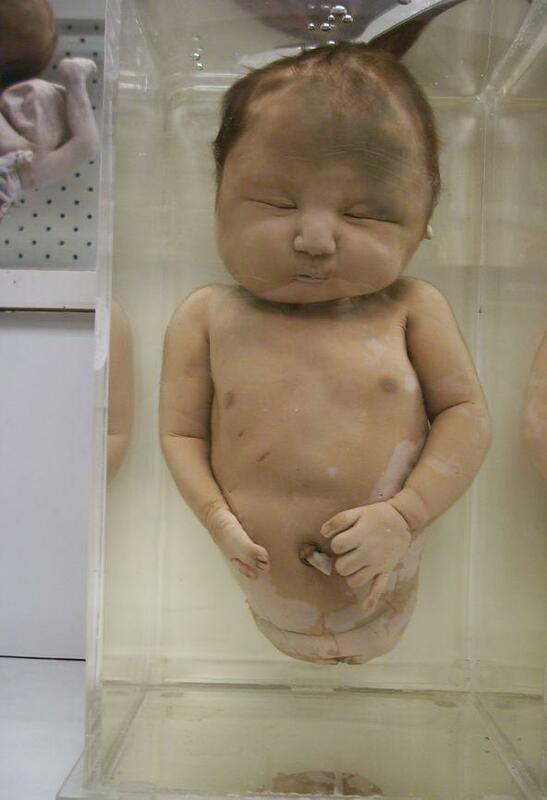 For years after the bombing of Hiroshima children were born with birth defects…. now it is starting to happen in Gaza. Same reasons…. same hatred. WAR IS NOT HEALTHY FOR CHILDREN OR OTHER LIVING THINGS….. NEITHER IS ZIONISM! Ramallah. Health professionals have observed a raise of mutations at birth in Gaza, since the Israeli offensive last year. One of these, is a story of a child born at the Shifa Hospital in the Gaza Strip. The child was born with severe congenital malformations, such as his face, eyes, short stature, flattened nose, reddish-brownish skin discoloration, short limbs with feet and toes severely curled towards the inside in a similar shape to that in gorillas. The baby weighed 4 kilos, suggesting that he was in good health. His appearance showed otherwise. His parents left him at the hospital and refuse to go back and claim him as their own child. The baby, also nicknamed the gorilla baby, is still under the custody of the hospital until his parents return to claim him. The hospital has tried to convince the parents to come and take their child especially that he isn’t in a stable condition and has problems in breathing. According to various medical reports, there has been an increase in the rates of birth defects in newborn children since 2009, with fifty cases of deformity compared to 30 cases in the years prior. There has also been a significant increase in the number of miscarriages amongst pregnant woman after the end of the war. Doctors say such malformations cannot occur for genetic reasons, nor are they related to the mother’s age or other factors. these come as a result of the white phosphorus used during the war. A few months earlier, the hospital was faced with a very similar case to this one , however, the baby died directly after it was born. White phosphorus (WP) is a material made from a common allotrope of the chemical element phosphorus that is used in smoke, tracer, illumination and incendiary munitions. As and incendiary weapon, WP burns fiercely and can set cloth, fuel, ammunition and other combustibles on fire. Since, WWII, it has been extensively used as an anti-personnel weapon capable of causing serious burns or death. The Israeli military used white phosphorus munitions in the Gaza War. The Israeli Occupation Forces repeatedly denied using white phosphorus munitions but acknowledged use after the war ended. Amnesty International said a fact-finding team found “indisputable evidence of the widespread use of white phosphorus” in crowded residential areas of Gaza City and elsewhere in the territory. WHAT’S REALLY HAPPENING IN OCCUPIED EAST JERUSALEM? Why are they really demonstrating in Sheikh Jarrah? In the last few weeks, the neighborhood of Sheikh Jarrah was featured in the headlines in Israel and abroad as a result of weekly demonstrations that take place in protest of the evacuation of Palestinian families from their homes and the entry of Jewish Israeli settlers into their homes. As a result of the hardlined policy that the Jerusalem police have taken towards the demonstrators and the arrest of dozens of them, a significant part of the public discourse about this matter revolves around freedom of expression and the severe harm to the right to demonstrate in a democratic state. Along side this principled and important discussion, this short survey seeks to clarify the historical process of this matter until the issuing of the evacuation order, as well as the current political implications. Sheikh Jarrah is a Palestinian neighborhood north of the Old City of Jerusalem. On the western side of the neighborhood, is an area of 18 dunams known as the Shimon Hatsadik compound, in name of the great high priest from the Second Temple era, who is buried there according to some traditions. A small Jewish community that settled in the late 19th century around the tomb was dispersed gradually beginning in the 1920s and 1930s and through 1948. During the Jordanian rule from 1948 to 1967, this area of land passed to the Jordanian government by the Enemy Property Law. In 1956, 28 Palestinian refugee families were settled in this compound by the Jordanian government and the UNRWA, in exchange for giving up their refugee status and payment of symbolic rent. In 1972, 27 families (one family left on its own accord) received notice that their rent was to be paid to the Sephardic Community Committee and to the Knesset Israel Committee – the owners of the homes whose existence until then was unknown. In the same year, the two committees began a process with the Israel Lands Authority to register the lands in their names, based upon Ottoman documents from the 19th century. About a decade later, in 1982, the two committees sued 23 families for non-payment of rent. According to the agreement reached between the lawyer of the Palestinian families and the representatives of the committee, the Palestinian families were declared “protected tenants” whose residence in the homes was guaranteed as long as they paid the rent to the committees. Some of the Palestinian families claimed that this agreement was signed without their consent. This decision constitutes the legal basis in the decisions of additional court petitions, as well as in the present cases. Most of the families refused to pay the rent for various reasons, including the reluctance to recognize the committees as the rightful owners. This refusal to pay rent stands at the basis of the legal proceedings against these families today, concluding with court-issued eviction orders from the disputed homes. These legal processes are not only between the committees and the Palestinian residents. The Nahlat Shimon International, a settler organization that has purchased part of the lands from the Sephardic Committee, has also submitted legal petitions against the residents. Until now, 3 families (al-Kurd, Hannun, and al-Ghawi) have been evicted, and legal proceedings are being held to evict a number of additional families who were not part of the agreement signed in 1982. Moreover, the court has allowed the entry of settlers into another building within the compound, which was built without a permit as an addition to a house where another branch of the al-Kurd family lives. Against the al- Kurd family, legal proceedings are being held, with the aim of bringing their eviction also from the original part of the home where they are living today. The Shimon haTsadik compound also was subject to another ownership legal case: in 1997 a Palestinian resident of Jerusalem, Suleiman al-Hijazi, petitioned the court, objecting to the ownership claims by the two committees, and claimed that he was the owner of the contended area. His claim was rejected in 2002, as was his appeal to the High Court four years later, while an additional petition to the District Court was rejected on 31 March 2008. Although the proceedings of this matter took place in the legal sphere, it is important to emphasize that this is not purely a matter of land ownership, but rather a first rate political issue. The settlers’ activity in Sheikh Jarrah constitutes an additional link in the chain of settlements – existing or planned – that aim to surround the historical basin of the Old City with an Israeli-Jewish ring and to create Jewish enclaves in the heart of Palestinian neighborhoods, in order to create a territorial contiguity that will endanger future political agreements in the future. In the Shimon haTsadik compound itself, the Nahlat Shimon International organization plans to destroy the existing buildings and build a new settlement of 200 housing units. Additional building plans of the settlers in Sheikh Jarrah include the Shephard’s Hotel compound, which was purchased by the patron of the settlers, Irving Moskowitz, and the Mufti’s Grove, opposite the hotel, and the Glassman Campus at the south-western part of the neighborhood. It is important to emphasize: The legal recognition of the rights of Jews to sue for ownership over properties that were theirs before 1948, and in their name to evict Palestinian families living there for decades, constitutes a precedence that is liable to have serious political consequences. Indeed the Israeli law does not recognize the right of Palestinians to sue in a similar manner for the return of their properties within the Green Line from before 1948, but a collective lawsuit – if only symbolic – is liable to place the State of Israel in the most embarrassing situation in both the local and international arenas, in addition to transforming the discussion around solving the Israeli-Palestinian conflict from discourse around the 1967 borders to one around the 1948 borders. It is doubtful whether a process such as this will serve the interests of the Israeli governments. Despite their declared obligation to a process of political negotiations, in reality, the governments of Israel in the last decades, together with the settler organizations, have gained control over properties in the heart of Palestinian neighborhoods, transforming them into settler enclaves that enjoy outrageous building rights and exist in the midst of ongoing confrontation with their environment and with the rule of law. Sheikh Jarrah is another link in the process that is transforming East Jerusalem to an arena where extremist organizations do as they please: taking control of properties in dubious ways, administering private police with government funding, and engaging in endless confrontation with the Palestinian population. All this is done with direct and indirect government support, while placing obstacles in the way of the prospects of achieving a resolution in Jerusalem and the region as a whole. Israel has once again displayed an arrogance that not even a Jewish mother could love. Basically, ‘nothing that happens today really matters….. we suffered in the past and that’s what counts’. 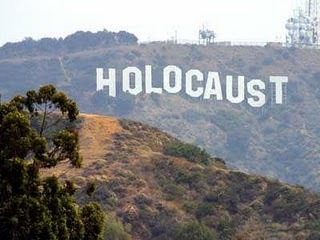 Cashing in on the Holocaust was always a big business….. but there are limits. Israel seems to disagree as can be seen in the following…..
Wednesday was International Holocaust Remembrance Day, and an Israeli public relations drive like this hasn’t been seen for ages. The timing of the unusual effort – never have so many ministers deployed across the globe – is not coincidental: When the world is talking Goldstone, we talk Holocaust, as if out to blur the impression. When the world talks occupation, we’ll talk Iran as if we wanted them to forget. A thousand speeches against anti-Semitism will not extinguish the flames ignited by Operation Cast Lead, flames that threaten not only Israel but the entire Jewish world. 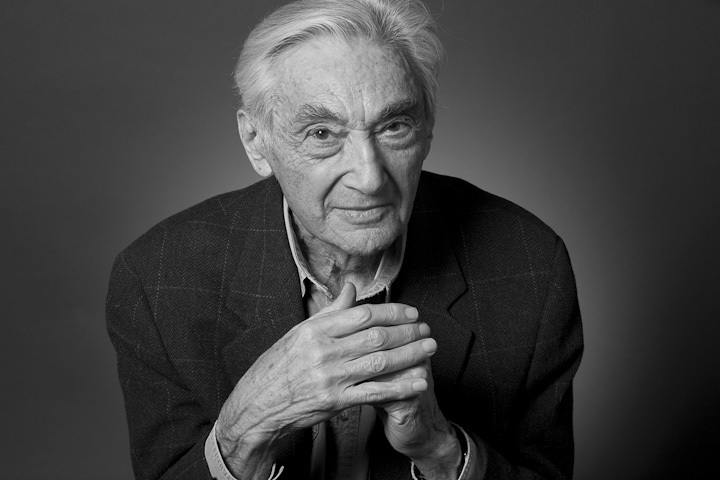 As long as Gaza is under blockade and Israel sinks into its institutionalized xenophobia, Holocaust speeches will remain hollow. As long as evil is rampant here at home, neither the world nor we will be able to accept our preaching to others, even if they deserve it. The above is taken from Gideon Levy’s report in todays HaAretz…. While most Arab states are basking in their impotence and bickering amongst themselves over a long list of issues, Turkey is slowly, but definitely, asserting itself as a leading power in the Middle East, besides Israel and Iran. Turkey, especially under the rule of Justice and Development Party (AKP) has been taking, and continues, to take strident steps in expanding its influence eastward, effectively grooming itself for the auspicious title of the leading state in the Sunni Muslim world. The Turks are filling a certain psychological-strategic vacuum in the Middle East, especially the Arab region. To be sure, this vacuum was created mostly as a result of the receding influence of traditional Arab powers, such as Egypt, which has become very much a stagnant, non-aspiring entity, thanks to its crippling subservience to the United States. The continuing aggrandizement of Turkey’s regional status is a real success story, which could be seen as a role model for other countries. Indeed, when the AKP came to power in 2002 through the ballot boxes — not political thuggery, as it is often the case in most Arab countries — it sought quietly and wisely to tackle a host of chronic problems besetting the Turkish republic. Eventually, the successful treatment of these mostly economic ills produced amazing effects and aftereffects, enabling the Turkish economy not only to reel from its erstwhile chronic stagnation, but also to make phenomenal growth, especially in the production and export sectors. Today, Turkey is the world’s 17th economic power. It is also a country that can proudly stand up and say “No” to Israel and the United States. Internally, the Turkish government sought to quietly resolve, or at least defuse, the enduring Kurdish problem mainly by acknowledging Kurdish grievances and recognizing the legitimacy of the Kurdish people’s linguistic and cultural rights. This very much helped stabilizing the domestic arena, and enhancing internal security, an essential requirement for economic prosperity. Under the Erdogan’s leadership, Turkey succeeded in resolving old problems with Armenia, thus depriving Israel and the American Jewish lobby of a sensitive pressure card that had been used repeatedly against Turkey in order to keep it revolving in the Israeli-American orbit. Nonetheless, the most remarkable thing about the AKP has been its adamant determination to preserve its free political will especially vis-à-vis the United States and Israel. Seven years ago, when the United States was about to invade Iraq, the Turkish Government firmly refused to allow American warplanes to use the Incirlik Air Base to attack Iraq. Prime Minister Erdogan defended the decision, which he said reflected the collective will of the Turkish people. This happened while most Arab regimes were vying among themselves to please and appease the Bush Administration, which was slaughtering Iraqis in the tens of thousands. Erdogan did not have to explain anything to the Americans. He just said “No” and that was it. Maintaining his country’s dignity in a world that looked more like a jungle and less like a civilized human community, Erdogan did not hesitate to fly in the face of the world’s special sacrosanct state, Israel, for its manifestly murderous and Nazi-like aggressions against the helpless Palestinian people. Eventually, while carefully maintaining relations with Israel, for certain practical necessities, Erdogan made it blatantly clear to the leaders of the Israeli regime that the future of Turkey’s relations with the Jewish state would very much depend on Israeli behavior, especially toward Palestinians. These are serious words coming from the leader of Israel’s erstwhile strategic ally in the Middle East. Israel got the message, but remains at a loss as to how to internalize and come to terms with it. It is true that non-Arab Turkey is not going to become a pro-active ally of Palestinians in the foreseeable future. However, one can safely argue that from now on, Turkey will not play deaf and dumb, and it will look the other way if, and when, Israel decides to embark on another Nazi-like, genocidal episode against the people of Gaza or other Palestinians. At the very least, Turkey will no longer be counted as a strategic asset for Israel as it had been the case for many years prior to the AKP’s advent to power. In contrast to the Turkish success story, the Arab world remains divided against itself, with many Arab states struggling to remain afloat economically while seriously and conspicuously ceding their sovereignty and national dignity to the United States, Israel’s guardian ally. In fact, the collective Arab situation is probably the worst since the collapse of the Ottoman Caliphate, following the World War I. The collective Arab failure to perform a comparatively easy task, such as lifting the crushing blockade of the Gaza Strip, seems to reflect profound impotence and paralysis transcending all levels. Similarly, the intensive preoccupation of each Arab state, or Sheikhdom, with its internal affairs, is really precluding any concerted Arab effort toward economic and political integration. The main reason for this enduring political paralysis — this overwhelming calamity — is the continued prevalence of tribal mentality and dynastic despotism throughout the Arab world. One of the most solid expressions of this tribal mentality is the fact that the mostly autocratic Arab rulers, irrespective of whether they adopt the royal or republican polity, exist in order to control their people and perpetuate themselves and their sons in power, not to lead their nations and advance their interests. For example, Egypt is a country of 80 million people that has immense human and other resources at its disposal. This very important country, which had once been nominated to become an African tiger, has been retreating in every conceivable sphere of life, thanks to the regime’s despotic policies and dismal political management. Predictably, this state of affair helped breeding and deepening the feelings of collective depression, apathy, and helplessness among ordinary Egyptians, which in turn pushed thousands of professionals to leave the country in search for dignity, respect, and work abroad. As to rich Arab countries ruled by ignorant, decadent, and dynastic despots, they are caught in the grip of the same frustrating circle, because the ultimate strategy of the ruling Sheikhs is to remain in power at any price, including succumbing to the will of foreign powers. Needless to say, these despots are in many instances plainly ignorant, as they have scandalously failed to translate the immense financial resources at their disposal into tangible and durable economic realities. Some Arab Sheikhdoms are actually so stupid that they have squandered billions of dollars building ostentatious, but economically fruitless, projects, such as high towers to show off their wealth. However, these tribal chieftains lack the primary means to shield their economies from real financial cries, as we saw recently in Dubai. It is this destructive tribal mentality that has prevented culturally homogenous countries, such the member states of the Arab Gulf Cooperation Council, from establishing a real common market or achieving monetary unity. Nor has it been able to build a credible military force that would shield these countries against a possible foreign aggression. There is no doubt that the collective Arab situation will continue to deteriorate further until the collective Arab house collapses completely. This is unless the Arab masses wake up from their dormancy, despair, and apathy, and decide to empower themselves and restore the usurped Arab dignity and freedom. Arabs are not stupid, and they can, if they want, learn from Turks, our brothers in faith. However, you can lead the proverbial horse to the water place, but you cannot force it to drink. It is really sad that in the very country where the Qur’an was revealed unto the Prophet Muhammed (peace be upon him) while wealthy billionaires are running after their beastly desires and mendaciously claiming to be upholding the rule of Shari`ah. Well, what is the kind of Shari`ah that allows a decadent prince, for example, to squander the Umma’s resources on his prurient desires, while millions of Muslims cannot find food to feed their kids? In the Qur’an, Allah warns such decadent people that their punishment would only be a matter of time. In the meanwhile, we say to our Turkish brothers, welcome back. We have long missed the Ottomans. So sad but true….. as can be seen in the ‘comedy’ news report on the earthquake in Haiti….. S I C K !! HEY …. 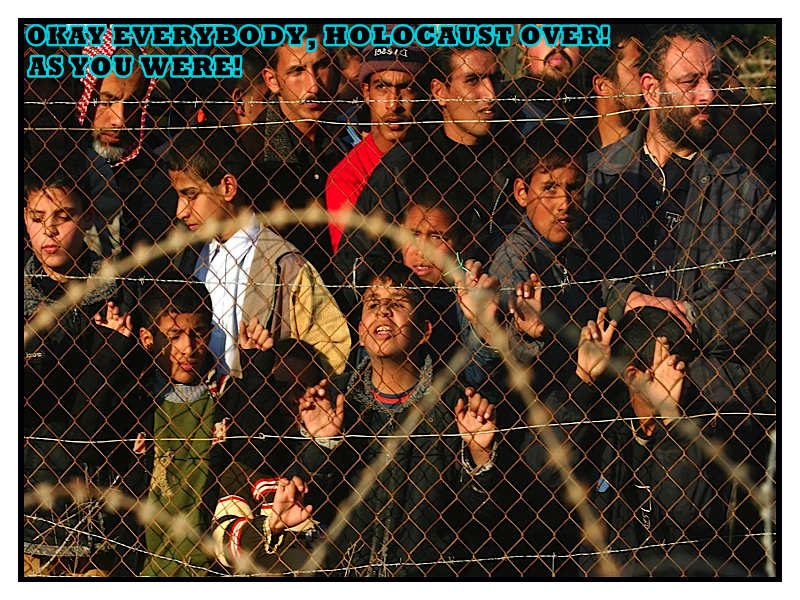 IT’S OUR HOLOCAUST MEMORIAL DAY, NOT YOURS! Nazareth – An Arab member of the Israeli parliament has sparked controversy among Jews and Arabs in Israel over his decision to join an official Israeli delegation commemorating International Holocaust Day today at a Nazi death camp in Poland. Barakeh has reported receiving a spate of hate mail, including a death threat, since he was invited to the remembrance service by the speaker of the parliament, or Knesset, over the opposition of many right-wing politicians. Barakeh, the leader of the Communist Party, the only joint Jewish-Arab faction in the Knesset, has defended his decision, even while admitting that his involvement can be exploited by Israeli officials. Barakeh, one of 10 Arabs in non-Zionist parties in the 120-member parliament, is reviled by many Israeli Jews because of his opposition to what he calls “racist” government policies, both towards Palestinians under occupation and towards the fifth of Israel’s citizens who are Arab. Barakeh’s attendance was backed last week by Ahmed Tibi, an Arab legislator with a rival party. Other Arab public figures in Israel have been critical. In a commentary, Zuheir Androus, editor of a newspaper in Galilee, reminded Barakeh that his family came from Saffuriya, a Palestinian village close to Nazareth that was ethnically cleansed during the Nakba, the Palestinian name for the 1948 war that founded Israel. Abdel Fattah said that, while it was compulsory for Arab children to learn about the Holocaust, the Nakba was excluded from the curriculum in both Arab and Jewish schools. “The demand from Israel that we recognise Jewish suffering in the Holocaust while we are required to deny our own people?s suffering in the Nakba is just another form of loyalty test,” he said. Far-right parties in the government have proposed that Arab citizens be required to take a loyalty oath or perform national service. But Nazir Majali, a journalist who helped to organise a trip of 260 Arabs and Jews to Auschwitz in 2003, at the height of the second intifada, called Barakeh “courageous.” He said the barriers of mutual suspicion between Arabs and Jews needed to be breached. 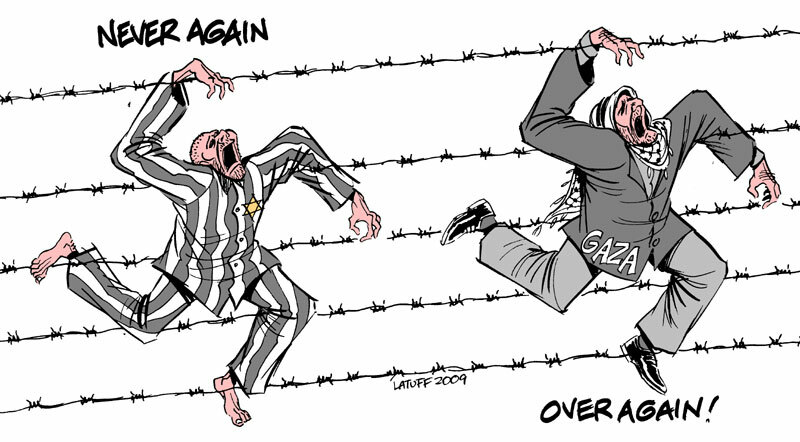 A poll conducted by Haifa University in the wake of Israel’s attack on Gaza showed that 40% of Israel’s Arab citizens believed that the Holocaust had not happened, up from 28% three years earlier. Jonathan Cook is a writer and journalist based in Nazareth, Israel. 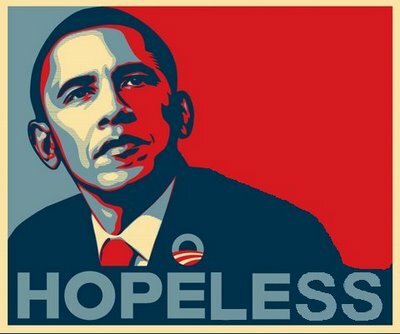 His latest books are ?Israel and the Clash of Civilisations: Iraq, Iran and the Plan to Remake the Middle East? (Pluto Press) and “Disappearing Palestine: Israel’s Experiments in Human Despair” (Zed Books). His website iswww.jkcook.net. The short video clip was filmed during the summer of 2008, in the houses of Sheikh Jarrah, not long before the eviction of the Al-Kurd family from their home. Two teenagers who knew English became the ambasadors of the entire neigborhood, and gave us a guided tour around it. They tell about the neighbourhood life before the eviction, in the shadow of settlers’ violence (including violence towards children), which is backed by the Israeli police force. The short clip, filmed by the hands of an amateur, may not offer much new, or particularly groudbreaking, in terms of its narration of political events, facts, or circumstances surrounding eviction and settlement in East Jerusalem. The clip nevertheless brings forth the vantage point of two Palestinian adolescents, refecting over the everyday reality of living in an occupied territory with a pending eviction order for your home. In this way, the narrative of these two teenagers may offer some depth to the -somewhat exhausted- political slogans of the day. “Neocolonialism is a new form of slavery”, a Gazan citizen. At the end of the year the external wall of the Esh-Shifa hospital – months ago refreshed with coats of paint color rusty – was covered with more than twenty paintings depicting the Israeli war and the suffering of the people. 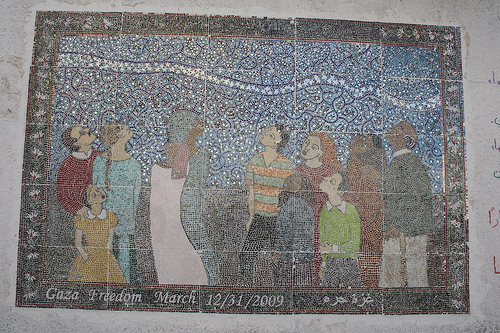 In Mustafa Hafez St, a superb mosaic was composed on the wall of the UNRWA HQ, near the main entrance. The mosaic is around 5 m. long and 4 m. large. It represents a group of Palestinians looking toward the sky. At the bottom is written “Gaza Freedom March 31.12.2009”. The master piece is made of bits of stone irregularly cut. With the reflect of the lights in the night, the mosaic become a firework and the small stones shine like thousands of stars or thousands of diamonds. In Tal El-Hawa, the most elegant district of Gaza City, the compound of ministries, although heavily damages during the Israeli war last winter, is still standing. 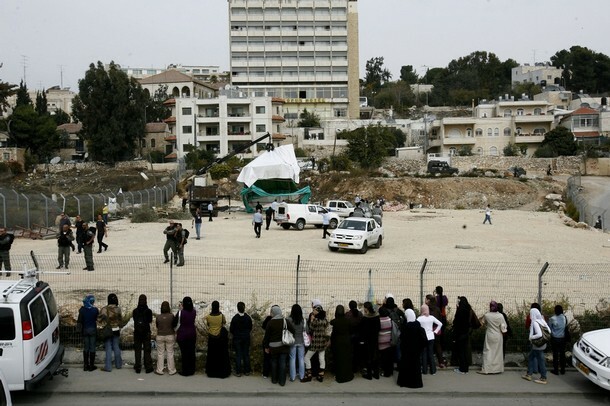 For a period of time the employees worked in the rubble in large beige tents crowned with small Palestinian flags. Sometime, someone wrote on an external wall: Why??! !…” One year after the Israeli offensive more graffiti have been added on a wall: “Gaza Free, No one can do for me, Only I can change my life”, “Sorry… Gaza”, “T’aime Palestine”, “Coming free Gaza”, “Gaza will not go down”, “27.12.2008”, i.e. the day the “Cast Lead” operation started. Despite the suffocating siege imposes on the Gaza Strip, the coming of the New Year was celebrated as usual, but only in a few restaurants. On an eatery’s window in Tal El-Hawa is written with cotton wool: “Happy New Year 2010”. Exactly one year ago the Gazans were under smart Israeli bombardments. On New Year’s Eve a group of 84 foreigners were taken to a cafeteria, The Gallery, where they attended a concert of hip-hop and ‘oud. After immense difficulties the activists were authorized to cross into Gaza, out of a group of more 1.400 stuck in Cairo. They arrived in the Strip late on Wednesday 30 December. Among them were four rabbis from Neturei Karta International, many Jews as well as Palestinians living abroad. The 24-hour visit permit given by the Egyptians was extended in order to respect the Shabbat of the rabbis. However, the whole visit was spoiled due to a very unusual tight security and a fire which broke out on Shabbat day in the kitchen of the small and practically unknown El-Jazeera cafeteria. For a while there was panic in the hotel. The cafeteria is located on the seashore, just a few meters from the Commodore Gaza Hotel where the internationals were hosted, but also just a few steps from the firemen station. Nevertheless, the foreign activists said new words should be coined because they were unable to express their feelings for being in Gaza. The locals as well couldn’t contain their emotions. A young American lady from the Freedom March For Gaza had collected around $19.000 in the USA, were telling us her mates. The money was spent in Egypt to buy goods for the besieged Gazans. All the goods were stored in a large hall in the Commodore Hotel and the hall was full. Many packs were still closed. On a table, at the back, there were what seemed to be medicines. Toward the end of the visit the last foreigners still in Gaza finished to fill Egyptian schoolbags with all sorts of stationery, toothbrushes, toothpaste, toys, etc. In addition, were brought from Egypt an amount of orange soda and potato ships. In the end, the situation turned nasty and the American girl lost her temper because she couldn’t personally give the goods to the recipients of her choice. But really there was no time left. The rabbis said they would be ready to depart at 20:00 on Saturday. All the remaining foreigners should leave by that time. The Government was under heavy pressures from the Egyptian side. The Palestinian security tried all the possible gentile ways to convince the foreigners to leave. It was hard and we understood the desire of the foreigners to remain more in Gaza and their frustrations. Therefore, the departure of the third bus at around 20:15, on Saturday 2 January, turned into a drama. The departure of the second bus shortly after 15:00 was already problematic: eleven foreigners were missing and those present refused to board the bus. Furthermore, on the bus a lovely Palestinian girl living in the States was weeping and repeating: “This is my country!!”. When the US girl lost her temper in the Commodore hall, she shouted: “No to Hamas!’, meaning she didn’t want the goods to be taken by the Government; she also shouted to the stoic security men: “Your people is dying from hunger!”. First of all, we presumed everything was done in good faith by the visiting group. But I was astonished by two facts: why the $19.000 or so were spent in Egypt? The cash money is necessary in Gaza, not in Egypt, and the shopkeepers need to sell. On top of that, why to buy in Egypt what is available in Gaza? Here, when such international rumors are repeated to the Gazans they are hurt, but they also laugh. Ahed assures that he eats better than in Great Britain… Sometimes, when we read articles and international reports about the Strip we don’t recognize it. There are in fact two different Gazas: one real on the ground and another one fabricated by the enemy propaganda or by inaccurate international reports. In the early 2000s, for instance. Christian Aid, a UK NGO, titled a report: “Gaza like Zimbabwe”. So far Gaza is not yet like Zimbabwe. There was indeed a period of acute shortages in Gaza. It lasted for several months and was the peak of the crisis. Were lacking cash money, food, candles, small batteries, flour, cigarettes, paper for printing and photocopying, glue, shoes, cardboard boxes, nylon bags and everything one can imagine. But this period is over. It ended at the beginning of 2008 when one night militants demolished the iron wall left by the Israeli master at the border with Egypt, high 8 m. and long several kms. All the population of the besieged Strip invaded peacefully Egypt for around ten days – including newborns and elderly, entrepreneurs and businessmen – and brought home everything they could buy. They are reports that are objective and depict accurately the real situation on the ground, like those of the Gaza-based Palestinian Center for Human Rights. Without exaggeration the situation is tragic and is deteriorating day after day. Life is impossible. However, the locals resist, are resilient and innovative, find new ways to remain alive under this form of modern slavery. On the other hand, international and local crocks are interested in making the situation more black than it is for their own benefits and for getting more funds. For sure they are plenty of poor, jobless, miserable, disabled people and for sure not all of them receive sufficient aid. However, these people keep their dignity and don’t approach the foreigners lying and begging for help. 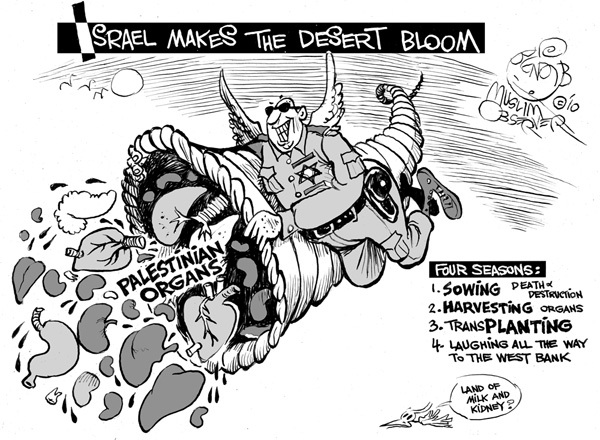 Moreover, some local NGOs which are supposed to help them are well known for sucking the blood of the Palestinian people like vampires, in addition to other entities which are supposed to rescue them. The locals are fed up with all these crocks. In Gaza nowadays nobody is dying from hunger. Despite the international embargo and the Israeli-imposed siege that has become routine now everything is available: biscuits, chocolate, clothing, toys, cigarettes, mobile phones, lab-tops, lingerie, cosmetics, perfumes, motorcycles, generators, refrigerators, washing machines… Furthermore, a good number of people eat red meat, chicken, turkey, pigeon, fish. The youth say they are doing miracles. The old militants say the Gazan people cannot be defeated. Paradoxically, absolutely everything is lacking in Gaza. When asked what they need, the Gazans will never tell you they need a WFP bag of flour or USAID Refined Vegetable Oil Vitamin A Fortified. The Gazans will tell you they are hungry indeed, very hungry, but hungry for justice, democracy, freedom, independence. It’s all and it’s enough. – Flora Nicoletta is an independent French journalist who lives in Gaza. She is currently working on her fourth book on the Palestinian question. Many students in the Gaza Strip aspire to a higher education abroad but the Israeli-Egyptian blockade deprives them of setting out on their journey. Ayman Quader is one of these students. He has finished his bachelor’s degree and was awarded a scholarship yet he cannot leave Gaza. The first term of his scholarship begins in February. Quader told our correspondent that he is being prevented from going out by the complete siege of the Gaza Strip. Quader calls on all those who are concerned with humanitarian conditions in Gaza to support him and his peers who seek a brighter future in schools abroad. Israel has imposed crippling restrictions on the Gaza Strip since 2007, preventing the shipment of food, fuel and other essentials into the populated region, pushing its impoverished population to the verge of starvation. The condition has been further worsened by Egypt’s refusal to open the Rafah crossing — the only alternative which is a border terminal not controlled by Israel —. 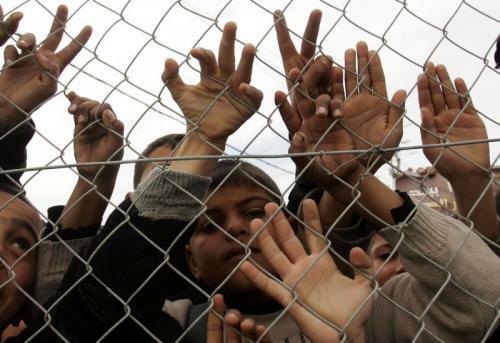 Along with the other residents of the Gaza Strip, students must wait until the next opening of the Rafah crossing. But there are no scheduled openings of the only gate for the 1.5 million Palestinians in the blockaded region. Academicians in Gaza argue that traveling abroad is one of the fundamental rights of students which must not be violated by political disputes. “I’m disappointed and frustrated as a teacher because my students are losing golden opportunities to pursue their studies abroad,” said a Gaza University teacher, Akreem Habeeb. Habeeb expressed regret that many of his students with scholarships from European and American universities lost their chance because they have not been allowed to leave the Gaza Strip. Students in the Gaza Strip have held several protests against the enclosure of their homeland, calling upon Egyptian authorities to facilitate their traveling abroad, requests that appear to fall on deaf ears in Cairo.